Most people don’t worry much about invasive plants during the winter months. After doing battle with them all summer or watching them take over our yards and open spaces during the growing season, we relax as the last of them die back in the fall. As cold winter weather grips the landscape, we take comfort knowing these aggressive species are tucked away in frozen soil for several months. As someone who’s attention is drawn to every infestation they see while out and about during the summer, I’m certainly enjoying this invasive plant-free time of year. While invasive plants may be out of our sight right now, they definitely should not be out of our mind. Now is the time to make plans for defeating these unwanted invaders. In 2018 SAWC is targeting Bohemian knotweed for eradication and we need your help. Bohemian knotweed is a hybrid between giant knotweed and Japanese knotweed. Knotweeds are native to parts of eastern Asia and are the highest-ranked invasive plant species found in Alaska. Once established at a site, Bohemian knotweed is extremely aggressive eventually outcompeting and displacing adjacent plants, including native trees, shrubs, and herbaceous plants as well as non-native ornamental plants. When native plant communities are replaced with knotweed, fish and wildlife habitat is impacted, berry-picking opportunities are lost, and the scenic qualities of an area are diminished. Knotweed can also reduce slope stability as the roots are weak compared to those of the native plants that it replaces. Amazingly, it can grow through asphalt, concrete, and brick walls! 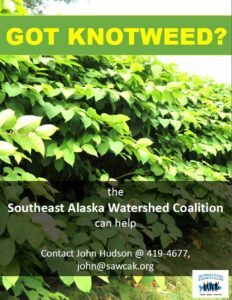 SAWC is seeking to partner with Juneau landowners to eradicate knotweed on their properties through a 50:50 cost share program. SAWC and the landowner will each bear 50% of eradication costs. If you or someone your know has a knotweed problem, please contact me at 419-4677 or john@sawcak.org. I am available to meet with individual landowners on their properties to assess knotweed infestations and discus treatment options and costs.